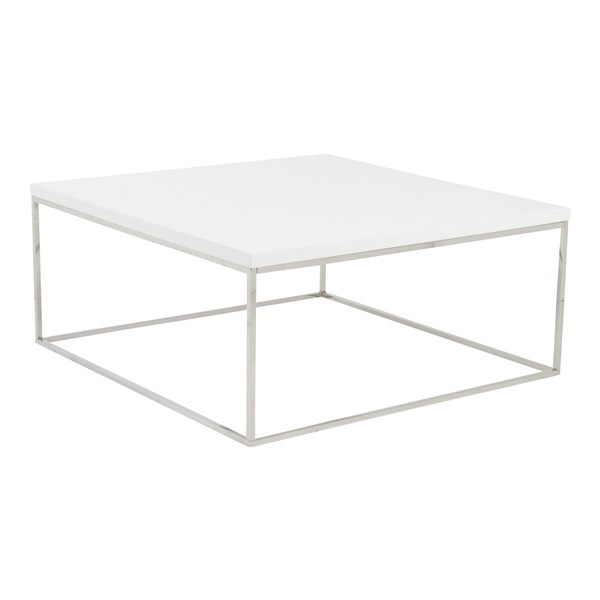 The Teresa Square Coffee Table adds a beautiful touch of artistry to a contemporary living space. Its clean sleek lines and minimalist style make it an ideal centerpiece for many decors. Slender legs and a crisp geometric design provide a graceful, understated style, while a wide surface offers the perfect spot for displaying magazines, books, art, collectibles or photographs. The Teresa�s base is expertly crafted from stainless steel, and designed to stand the test of time. A lustrous polished base finish and a high-gloss lacquer top add luminous, sophisticated shine. The table wipes clean easily, so fingerprints and coffee rings are no problem. Choose from several different stylish, contemporary top colors for the look that�s perfect for your unique space. Group the Teresa Square Coffee Table with the Teresa End Table and the Teresa Coffee Table for a seamless living space. Note: the Teresa is also known as Piazza Console Table, which is part of the Chiasso Collection.